The construction project that caused damages to the Anahita Temple in Kangavar in Kermanshah Province was halted last week. The decision to halt the project was made following publication of a report on the mess at the Parthian era site by the Persian service of the Mehr News Agency. of columns of the Anahita Temple in an undated photo. The Kangavar Endowments and Charity Affairs Office (KECAO) began construction of concrete foundations to develop the shrine of Imamzadeh Ebrahim (AS) located on the perimeter of the Anahita Temple in December. Construction of a hotel at the location is a part of the development plan. “The construction project near the Anahita Temple was illegal so it was barred by a court order,” Kermanshah Cultural Heritage, Tourism and Handicrafts Department (KCHTHD) Director Asadollah Beiranvand told Mehr on Friday. He said that the office had begun the project without receiving approval from the KCHTHD. Meanwhile, KECAO Director Mohammad Qorbani denied Beiranvand’s remarks and said that construction was carried out based on mutual agreement between the KCHTHD and KECAO. 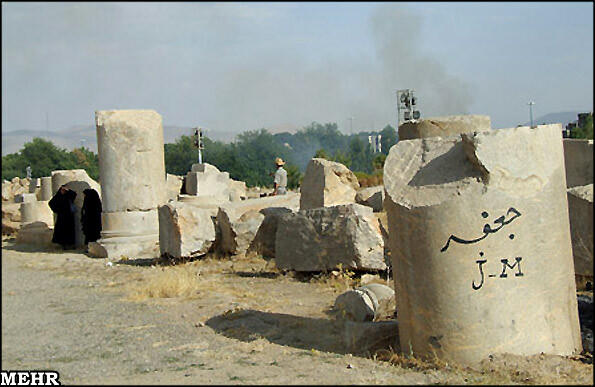 According to Qorbani, the development plan was approved by the Cultural Heritage, Tourism and Handicrafts Organization in 1994, but implementation of the plan was postponed for unspecified reasons. The development plan received approval of the Kermanshah Governor’s General Office in 2009 and the final version of it was signed during a session attended by officials from the KCHTHD, the KECAO and the Kermanshah governor general on December 19, 2009. Several column bases and ruins of a wall remain from the magnificent Greek-style Anahita Temple, which is believed to have been built circa 200 BC. The temple was used during the Parthian era (248 BC-224) as well as the Sassanid era (224-651). The monument was also damaged as it was used for various purposes by the Seljuk, Ilkhanid, Safavid, and Qajar dynasties, which ruled in Iran over the past centuries. In addition, the Anahita Temple was seriously damaged by an earthquake in 1957. Afterwards, people invaded the perimeter of the site, using stones from the temple to rebuild their homes at that location.